The following article is divided into two sections. The first section provides information about the invention of movable type printing by Johann Gutenberg and the operation of his innovative technology; the second section considers the importance of printing for the propagation and success of the Reformation by looking at how Martin Luther embraced the process for his work. Johann Gutenberg, born in Mainz about 1397, is credited with development of the movable type printing process sometime around 1450 while living in Strassburg where he was a goldsmith. Movable type involved the combination of individual letter characters made of lead and tin that were ordered in words and spaces in rows that were then combined to make the device that was inked to print a page of text. It was a revolutionary invention because books had been reproduced by hand and were costly. 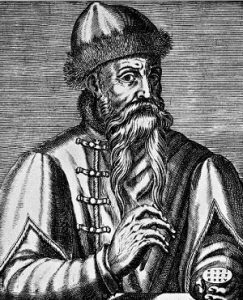 Even though Gutenberg was the father of the movable type press he, sadly, lost his printing business to a creditor and died poor in 1468. Gutenberg’s invention of movable type combined with existing materials, image reproduction techniques, and equipment resulted in a new, more efficient, and faster way to print. 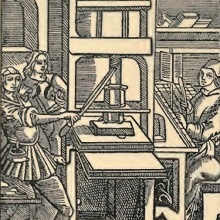 Paper, ink, the screw press, woodcuts, and engraving techniques for images were used and improved as movable type printing increased in use and revolutionized communication. To understand the significance of Gutenberg’s contribution to printing it is important to understand the process for manufacturing the individual characters of type. Gutenberg exercised his goldsmith skills to create movable type characters which are called “sorts.” A sort is the individual character, whether it is a number, letter, punctuation mark, or specialized figure. The first step in the process for manufacturing a sort was to make a punch from a hard metal upon which the character was tooled to shape. The character on the sort looked much like the letter of a typewriter that strikes the ribbon to ink the paper when a key is pressed. The second step was to take this punch and stamp it into a block of softer metal known as the matrix. Third, the matrix was clamped into a casting fixture that created a cavity with the matrix at the bottom to shape the character sort. The fourth step was to pour a molten alloy of lead and tin into the open end of the cavity of the casting fixture. Finally, after the casting cooled, the fixture was opened, the freshly cast sort removed, and then it was processed further to remove metal that had leaked between the seams of the casting fixture and the matrix. The casting fixture could then be reused to make another identical copy of the sort, or it could be removed and another matrix inserted to make a different sort. The beauty of this technique is that it yielded many copies of consistent type fairly quickly. The shape of a sort would have been very much like a stick of butter with a letter or number shape projecting from its end as in the example of the typewriter mentioned earlier. The printer, after casting multiple copies of each sort of a complete font, could then go about the work of printing. Type was set in a frame or holder known as a “form” to create a page of text. It was aligned from right to left, starting at the lower right-hand corner. The first row was set, then the next on top of it, and so forth. When printing, it is necessary to create the text in the form from right to left so it will read from left to right, unless of course, the language printed reads from right to left, such as Hebrew, in which case the text would be aligned in the form from left to right. To make filling the form easier, it was angled away from the printer at waist level so it could be seen clearly for the setting process and to keep the set type flat to the bottom of the form. The form was angled about like one might hold a book for reading. The more copies of each character a printer had in each font, the more efficient he could be in his operation. As the printer finished printing all the copies of a page that were desired, the form was removed from the press and broken down by an assistant who would then reuse the type to set the next form while the printer used another filled form to print the next page. Thus, the more forms, the more copies of sorts to fill the forms, the more efficient the operation and the more money to be made. Sometimes when printers ran out of copies of a sort character they would substitute a more abundant sort that was somewhat shaped like the depleted one, which is one of the reasons why early printed books sometimes have several inconsistencies within a page. For example, if a printer ran out of the lower-case letter “d” while filling a form, the letter “p” might be substituted and rotated 180 degrees when it was set in the form. The shape and size would be the same, but the rotation of the sort might yield an alignment problem so that the word would look crooked when printed. Another aspect of technology required for printing was paper of sufficient quality and quantity to mass produce publications using Gutenberg’s movable type. Quality paper had become more readily available in Europe about a century before Gutenberg’s process was developed, but its production was a labor-intensive process. The raw material for paper, which was usually linen rags, was first broken down into its constituent fibers by pounding the cloth with stones into pulp which was then hydrated in a vat of water and then pounded further to form a pasty liquid or slurry. The paper maker then lowered a sheet of metal mesh into the slurry covering its surface with linen cellulose paste. The mold was lifted above the slurry as it was gently shaken allowing the excess moisture to drain. The delicate, damp sheet was then carefully removed from the mold and placed between two pieces of felt in a screw press. Then, the process was repeated with another wet sheet being added to the stack, topped with felt, and so on until a suitable stack of paper and felt separators was achieved. The stack was then pressed to squeeze as much water as possible from the wet paper. The sheets were peeled from their felt separators then hung on a line to dry. 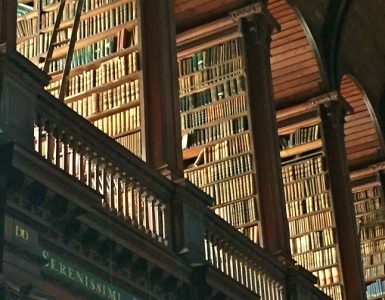 The extraordinary amount of work required to produce paper has paid off in the long run because early books have survived in wonderful condition due to the non-acidic processing of the quality linen fibers. The rags that had been good for nothing but discarding were recycled to provide the raw materials to preserve the writings of the past including Gutenberg’s lovely Bible. Inks used for Gutenberg’s printing were like inks used for centuries up until comparatively recently. Lampblack, which is the carbon residue from a flame (i.e. soot), was blended with varnish and/or boiled linseed oil. Essentially, the ink of Gutenberg’s era was a black oil paint like that used by artists. Printers often mixed their own ink and in some cases had secret ingredients to make their inks have unique appearances. In the case of Gutenberg, one analysis has determined that he used precious metal dust as a part of his ink formula to give an iridescent quality to the printed pages in his edition of the Bible. Being a goldsmith, it makes sense that he would know how to incorporate precious metals into the ink to give it a unique Gutenbergian touch. The Beineke Rare Book and Manuscript Library at Yale University has a lovely example of a Gutenberg Bible. Interestingly, the press was probably the least of Gutenberg’s technical problems as he worked out the details of printing with movable type. Not only was the screw press used for the crude printing of the era that used wood blocks and engraving for reproduction, but other technologies of the day, such as wine making and book binding, employed it as well. The construction of a typical press has been described by Encyclopedia Britannica, 1963. A typical press…consisted of two stout upright pieces of wood joined by two horizontal beams. A screw, working in the upper beam and turned by a long bar, exerted pressure downward upon a wooden plank placed on the paper…. The pitch of the screw was made [steep]…so that the necessary rise and fall was gained within the quarter turn obtainable with a fixed bar. The twisting motion of the turning screw was counteracted by suspending the platen (the wooden plank) from a hollow wooden box that slid inside closely fitting guides while the screw turned freely within. The upright beams were frequently braced to the ceiling to keep the press steady. The press used in Gutenberg’s technology was simple and of the one-pull design described by Britannica. Even though the press was simple, it could print only one half of one side of a sheet of paper necessitating four press cycles for each sheet. The process began with inking the form filled with type, then the sheet of paper was aligned precisely and seated carefully onto the inked form. The printer would then pull the lever to actuate the downward motion of the press platen to contact the paper, after which the lever was moved back to its home position so the newly printed page could be removed. The paper used for the Gutenberg forty-two-line Bible measured approximately 17 by 24 inches, and when it was folded once it made two folio leaves measuring 17 by 12. For other printing projects a sheet might be folded again to make a quarto, and then again to make an octavo page-sized book. The reproduction of images had been accomplished for years primarily with woodcutting, but an imaging technology called engraving came along in the fifteenth century. As the name implies, woodcut printing involved the cutting of wooden blocks in such a way as to form the images one desired for reproduction. Woodcut images were made by carving the image into the wood so that the peaks of wood remaining after excavation would hold the ink for printing the image onto paper much like a rubber stamp and ink pad are used to reproduce images and text. Tessa Watt notes that a quality wood block could yield several thousand copies and that one woodcut block made of pear wood survived for ninety years and was used to produce a total of five to six thousand copies. Engraving involved cutting an image into a sheet of copper with a sharp tool. Costs for engraving were higher than woodcutting due to the price of the metal and the greater skill required for tooling the image. Engraved printing runs were short because early engravers could not excavate the grooves deep enough into the metal to produce more than a few hundred copies before image quality deteriorated. By far, the way to reproduce images in the era of the Reformation was woodcutting because engraving would not become cost effective until the mid to late seventeenth century. From Gutenberg’s era into the first half of the sixteenth century several improvements were made to the printing press. These included a sliding table holding the form to speed printing both halves of a sheet of paper; the tympan and frisket assembly was invented to ease alignment and changing of the paper while increasing press efficiency, and then the two-pull press supplanted the sliding table and further improved and expedited printing. A final improvement made was changing the screw of the press from one made of wood to one constructed of iron. The early presses had used a massive, heavy, wooden screw to activate the printing operation but they were hard to use due to wood friction and sometimes broke under force. It is believed that the wooden screw was changed for metal sometime around 1550 by Leonhard Danner, who was a screw maker in Nürnberg. An important result of the movable type printing process is the speed at which multiple copies of any printed work could be reproduced. As printing technology improved from the mid-fifteenth-century into the early sixteenth-century, the rate of printing increased as well. When considering press rates several factors enter the equation including the skill of the operator, the quality of the print, the features of the press, the number of workers in the shop, the paper and ink, the weather, and the number of breaks taken by the workers. 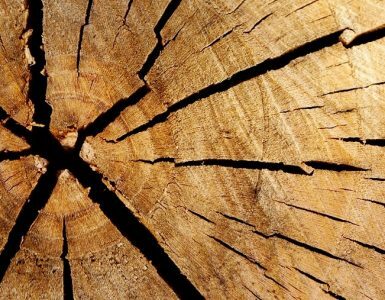 Michael Pollak has concluded that each wooden press could produce as many as 1,500 sides per day and that higher quality work reduced the rate considerably. A common rate of production for normal printing was about 1,250 to 1,500 sides per day. A simple one-sided publication might have a run of 1,500 sheets in a single day. If the document was a portion of a full sheet even greater quantities could be produced. It can be generally stated that there were two types of printed materials each of which targeted different segments of Renaissance and then Reformation culture. The first printed materials were illustrated simple publications designed to reach those who could not read; the second type of publication included books and pamphlets for the literate. One illustrated publication was the broadside, also known as a broadsheet, which was a single sheet publication that could be likened to a modern-day poster. The early broadside was heavy on the graphics and used text minimally if at all. Keep in mind here that the iconography of the time had been used in the church to instruct the people because the mass of the population could not read. Before movable type these publications were produced using woodcuts, but after movable type came into use broadsides were made using a combination of type and woodcuts. Broadsides were often published during the Reformation for the explicit purpose of catechizing and teaching scripture lessons. Due to the high cost of Bibles, the broadsides were the Bibles for the poor. The price of books was high in the days of the Reformation but not as high as the old manuscript editions. One factor that contributed to the costliness of books was the price of paper, which constituted as much as three-quarters of the material costs of a book. One of the reasons why many early books extant today do not have their blank end papers any more is because they were cut out by the owners to be used for letter writing or other purposes. Paper was disproportionately expensive. Generally, books were luxuries that were purchased by the wealthy. Even though movable type had vastly improved publishing efficiency, books were still a rarity; books were cheaper, but they were still relatively expensive. Gawthrop and Strauss have concluded that the ordinary artisan living in 1522 would have to work for one week to pay for a New Testament in German. To purchase a complete German Bible required a common laborer’s toil for a month. Another publication of the era that was used with great success during the Reformation was the pamphlet, which was a brief unbound book dealing with topical or time sensitive subject matter. It seems that the Germans were especially involved in the printing of pamphlets. Martin Luther used pamphlets in such a timely and efficient manner that when theological or other issues of interest to him arose, he produced a pamphlet post haste. He responded quickly to his opponents’ views because pamphlets could be produced rapidly. Before 1518 there was minimal pamphlet activity in Europe. Six years later in 1524, there is indication that the production of pamphlets had increased one-thousand percent and much of the increase was due to the pen of Martin Luther. By the end of the fifteenth-century, movable type books were distributed throughout Europe. The new books were most often sold through book fairs which was the way manuscript books had been marketed. As book sales grew it became necessary to establish distribution outlets in the major cities of Europe. Printers did their own advertising and distribution because, as Elizabeth Eisenstein has observed, they were “self-serving publicists, early printers issued book lists, circulars, and broadsides. They put their firm’s name, emblem, and shop address on the front page of their books.” From the 1480s on, international trade became a reality for large printers like Koberger in Nürnberg, and Cranach and Döring in Wittenberg. Until late in the sixteenth century, bookshops were uncommon except for those in capitals and large cities. Gutenberg’s press had given rise to a growth industry in Europe. In summary, movable type printing was the communication revolution that contributed to the Renaissance and was used effectively by the the Reformers to propagate their teaching. In the years that passed from Gutenberg’s era to Luther’s, the printing industry expanded and improved. The press machine itself enjoyed improvements in technology resulting in increased productivity. German printing had grown from mom-and-pop businesses into multi-facility operations. Printing would continue to enjoy growth as more and more material was written and published during the years of the Reformation. Even though printed goods, particularly books, were expensive, creative entrepreneurs increased their bottom lines producing broadsides and pamphlets. With increased use of printing came increased demand and greater demand necessitated greater means of distribution. Movable type printing would be exploited by the Protestants, but especially by Martin Luther. When Martin Luther nailed his Ninety-Five Theses to the door of the Castle Church in Wittenberg on October 31, 1517, he was calling for a disputation concerning indulgences. His action was not one of defiant vandalism; the church door was the bulletin board of the day. However, Luther’s request for a disputation went unanswered, but the Ninety-Five Theses caused such controversy in their day that they are considered the spark that ignighted the Reformation. Due to the provocative nature of his handwritten document, it was printed in Wittenberg first in Latin and then in translations of other European languages. In 1518, the German translation was published and over the course of the next two years an additional twenty-two German editions were printed. If it had not been for the efficiency of movable type printing for duplicating the document, his reforming work and influence on other reformers would have developed differently. Before considering Luther’s use of printing a preliminary concern is the literacy demographics of Germans at the time of the Reformation. In Germany, overall literacy has been estimated to be as low as five percent in rural areas with urban literacy peaking at thirty percent. Such circumstances raise the question, “How did the Reformation take hold in Germany if literature was important for its success?” One answer came from Nürnberg, as G. H. Putnam has observed, where “as in other towns, it became the practice to read the books of Luther out loud in the market-place,” and then there was the case of the village of Speyer where the people were “described as having the books read to them at supper, and as making transcripts of them.” A literate person, such as a doctor, lawyer, or teacher, would acquire Luther’s latest pamphlet and then read it to crowds or households gathered for the purpose. 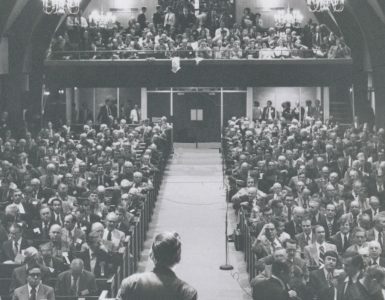 The educated read to others, and when there were literate individuals in the audience they sometimes copied down what they were hearing and printed it themselves for distribution. The availability of printed works and manuscript copies in the vernacular motivated some of the illiterate to learn how to read. Another aspect to consider is the size of the printing industry in Germany. Luther and the other German reformers needed sufficient printing equipment for the fullest distribution of their publications. 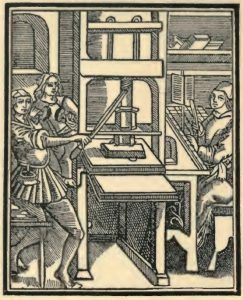 The years between Guttenberg’s first press and Luther’s use of the technology in the 1520s brought a significant increase in the number of printing businesses. Richard Cole has investigated the publication of works by Martin Luther and other Protestants, concluding that Germany dominated the industry. [There were] almost fifty identifiable printers of Luther’s works in the 1520s printing in twelve separate locations…There are another seventy printers in various locations printing mostly Reformation tracts. Overall for the sixteenth-century, there are three hundred and ninety-one printers, eight hundred and ninety-four authors and one hundred and twenty-five cities…. Eighty-two of the smaller locations where printers lived and worked have not been the subject of specific print research. The odds are overwhelmingly in favor of the contention that if a German printer published pamphlets especially in the 1520s, he published Protestant materials. What is often thought of as a war of pamphlets between the followers of Luther and the pope in Rome may be seen as a lopsided one. Since Germany was the homeland of Guttenberg’s technology it follows that the printing industry would have seen its greatest growth in the land of its invention. In all regions of Germany a given purchaser could buy more books at lower prices and bring them into the study or library. Germany was an ideal location for publishing because the country had enough printers to enable the greatest distribution of Luther’s writings. With an abundance of presses available and secondary ways of presenting his writings to the illiterate, Luther fed Germany with text after text. Richard Crofts has tabulated and charted the number of publications produced in Germany from 1521 to 1545 and found Luther to be the primary publisher. The first table Crofts compiled compared the number of printed works per five-year period, which included non-religious works, works by reformers, and works by Roman Catholics. Based on the data he compiled from his source for currently extant examples, the period from 1521 to 1545 produced a total of 5,651 works with nearly a third published by reformers, another third were non-religious titles, less than twenty percent were by Catholics, and the remainder were other subjects. In the first half of the same period, the reformers’ works constituted an even greater proportion of the output with them producing nearly half of the works. Then Crofts presented another analysis of the 1521 to 1545 era. In this case the period considered was annually with the publications distributed in three categories that included Luther’s percentage of the reformers’ works, Luther’s percentage of the total published works, and the percentage of Luther’s works published in German. What is staggering about the analysis is that in the twenty-five-year period covered by the study, Luther’s publications averaged 51.3 percent of the total reformers’ works with the highest year 1522 at 71% and the lowest year 1540 at 22.2%. Luther’s concern to publish in the German vernacular for his people is exemplified in his averaging 88.6% of his works in German with the lowest level 66.7% in 1538, and the highest 100% in 1528, 1529, and 1542. Publications made in the vernacular were important for Luther and other reformers because reaching the masses necessitated abandoning the use of Latin alone and embracing the languages of the people. As with any writer, the printer chosen for publishing is an important decision and Luther’s first Wittenberg printer was Johann Grünenberg. At the request of the Wittenberg University leadership Grünenberg was moved to Wittenberg from Erfurt in 1508 to set up a printing operation. His skill and competence at his trade is shown in his publication of Andreas Bodenstein von Karlstadt’s Distinctiones Thomistarum, which was the first work printed in Wittenberg in which Hebrew type was set. Grünenberg also published Luther’s translation and commentary on Psalms 6, 32, 38, 51, 102, 130, and 143, titled, The Seven Penitential Psalms, which was a popular publication that was reprinted in Leipzig, Strasburg, and Erfurt. Using Grünenberg for his printer was convenient for Luther because he could keep a close eye on the process while he taught in the university. Luther eventually became dissatisfied with Grünenberg’s work, so he brought the experienced and successful printer Melchior Lotther to Wittenberg from Leipzig to establish a printing shop. Lotther completed the set-up of his Wittenberg facility and when he returned to Leipzig he gave the management of the operation to his sons, Michael and Melchior the Younger. It seems that Luther had a good relationship with the Lotthers because it appears he may have introduced one of his first cousins to Michael which led to their marriage. Luther found the Lotthers’s printing business an efficient operation for publishing his writings and spreading the Reformation. In a letter to John Lang written from Wittenberg in 1520, Luther mentions his soon-to-be-published Second Lectures on the Psalms. To reduce the potential for a financial loss, as was the case with one of his recent publications, Luther and the printer decided to print and sell the first fascicle (section) of the book. The number of each fascicle sold was perceived as a good indication of how many copies of each additional fascicle would be required. Gottfried G. Krodel, the editor of volume forty-eight of the American edition of Luther’s Works, believes that the publication of Second Lectures on the Psalms was the first time such a publishing technique had ever been accomplished. Two of Luther’s greatest contributions to the Reformation were his German New Testament, published in 1522, which was then followed by the complete Bible in 1534. Luther thought it was important to get the Word of God into the language of the people, but widespread acceptance of his German translation was hampered by the lack of a single common tongue. At the time Luther translated the Bible there were several dialects in the country. Remarkably, Luther’s translation of the New Testament not only provided a vernacular version of the Bible but it also was used to teach reading to the illiterate and thereby promoted a single German language. As with many other publications by Luther, the New Testament and the German Bible were well received. One prominent printer in Wittenberg, Hans Lufft, produced thousands of Luther’s Bibles between 1534 and 1574. Lufft even claimed to own the rights to Luther’s German Bible when the reformer died in 1546, but Luther had not granted the rights to anyone. Besides Grünenberg, Lufft, and the Lotthers, several other printers established printing businesses in Wittenberg. Nickel Schirlentz operated a press in his home for several years. Hans Weiss, who had worked for the Lotthers until 1525, ventured out on his own and established a printing business. The artist Lucas Cranach partnered with goldsmith Christian Döring to establish a printing shop that produced several dozen Luther pamphlets between 1522 and 1525. One of Cranach and Döring’s former employees, Joseph Klug, published Luther’s great hymn, “A Mighty Fortress,” in his newly opened shop in 1529. As Luther’s popularity spread through his writing printers took advantage of the boon, but some did so honorably while others did not. Unauthorized printing of Martin Luther’s works was a considerable problem. Publishers saw the profit potential and printed their own editions of his works often with little or no concern for the quality of the finished product. On one occasion, some of Luther’s unfinished books were stolen from his local printers, taken to a town where the victimized printers’ publication rights were not valid, and the stolen materials were then completed and sold. In September of 1525, a similar theft occurred in Wittenberg. This incident led to Luther complaining to the magistrates in Nürnberg that several pages of a book of his sermons were stolen from his local printer and were being bound by a printer in their city to produce a pirated volume. In a later edition of Luther’s German New Testament he included in his preface the sarcastic but thoroughly Martinian comment, “I beg all my friends and foes, my masters, printers, and readers, let this New Testament be mine. If you lack one, then make one for yourselves…. But this Testament is Luther’s German Testament.” Luther’s successful use of the publication industry and his considerable labor translating the Bible into German were seen by unscrupulous printers as fair game for their own bottom lines. Not only was Luther frustrated by the pirating of his works but he was also angry about the poor quality of the work produced by his own printers. Writing to George Spalatin in 1521, Luther expressed his displeasure with careless typesetters who created errors in his writings and perpetuated the compromised publications through successive editions. Later in the letter Luther decided to allow “the same old Johnny” to go ahead and print the German homilies because he had already started the project. Luther’s problems with printers were not unique because Andreas Karlstadt complained that whole columns of print were discarded and sentences muddled by printers of his works. As printing technology improved so did the quality of the publications. Unfortunately, technology could not improve the quality of the printers themselves. It has been shown that the invention of movable type printing wrought a technological revolution in Europe. After more than sixty years of development and improvement the printers of Luther’s era could efficiently publish his books, pamphlets, tracts, treatises, hymns, and German translations of Scripture. Luther was a proficient exploiter of printing technology, which is exemplified in his myriad publications sometimes in multiple editions that were then translated by others into additional languages. However, as is often the case with new technology there were challenges to its advancement. The publications were distributed in a Germany with literacy levels varying from five to thirty percent. Authors suffered both shame and inaccurate assessments of their teachings due to poorly produced publications by indifferent and/or unskilled printers. An even greater problem was authors having to endure the theft of their intellectual property by opportunistic printers. Books were expensive and it was often found that the lower cost publications, such as pamphlets and tracts, had to be used even though their brevity sometimes forced an insufficient amount of content for the author’s case to be made. Despite the problems, the movable type printing press survived its first century of use and became the way that texts were preserved and communicated. Finally, the following quote gives a sense of how greatly Gutenberg’s wonder changed the West. Martin Luther embraced printing technology and efficiently used it for the distribution of his writings, but most importantly for his readers, the printing press provided the German Bible so that all who were literate could read the Word of God in their own language. Sources—Lucien Febvre and Jean-Henri Martin, The Coming of the Book (New York: Verso, 1990), 33. Victor Scholderer, Johann Gutenberg: The Inventor of Printing (London: Trustees of the British Museum, 1970), 23. Michael Pollak, “The Performance of the Wooden Printing Press,” The Library Quarterly 42 (April 1972): 220, 262. Encyclopedia Britannica, 1963, “Printing Press”. Tessa Watt, Cheap Print and Popular Piety, 1550-1640 (Cambridge: Cambridge University Press, 1991), 141, 142, 262. Richard G. Cole, “The Dynamics of Printing in the Sixteenth Century,” in The Social History of the Reformation, ed. L. P. Buck and J. W. Zophy (Columbus: Ohio State University Press, 1972), 95. 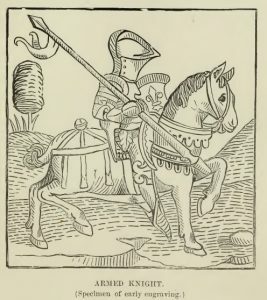 G. H. Putnam, Books and their Makers During the Middle Ages, vol. 1, 2nd ed. (New York: The Knickerbocker Press, 1898), 350; vol. 2, 222, 223-24, 230, 246. R. A. Houston, Literacy in Early Modern Europe: Culture and Education, 1500-1800 (New York: Longman, 1988), 169, 185. Gawthrop and Strauss, “Protestantism and Literacy in Early Modern Germany” Past and Present 104 (1984): 31-55. Richard G. Cole, ed. H. Koehler, “Reformation Pamphlets and the Communication Processes,” Flugschriften als Massenmedium (1981): 149-51. Elizabeth Eisenstein, The Printing Press as an Agent of Change: Communications and Cultural Transformations in Early Modern Europe (Cambridge: Cambridge University Press, 1979), 57-59, 72. M. H. Black, “The Printed Bible,” in The Cambridge History of the Bible: The West from the Reformation to the Present Day, ed. by S. L. Greenslade (Cambridge: Cambridge University Press, 1963), 429. M. U. Edwards, Jr., Printing, Propaganda, and Martin Luther (Berkeley: University of California, 1994), 37-38. R. G. Cole, “Reformation Printers: Unsung Heroes,” Sixteenth Century Journal 15 (Fall 1984), 335, 337. Richard A. Crofts, “Printing, Reform, & the Catholic Reformation in Germany, 1521-1545,” Sixteenth Century Journal 16:3 (Fall 1985), 369-381, Appendix A. Maria Grossman, “Wittenberg Printing, Early 16th-Century,” Sixteenth Century Essays and Studies 1 (1970): 65-69, 73. The Works of Martin Luther, ed. Gottfried G. Krodel, vol. 48, (Philadelphia: Fortress Press, 1967), 19, 148-151. W. G. Tillmanns, “The Lotthers: Forgotten Printers of the Reformation,” Concordia Theological Monthly 22:2 (Feb. 1951): 261. Michael H. Black, “The Printed Bible,” in Cambridge History of the Bible, vol. 3, The West from the Reformation to the Present Day, ed. S. L. Greenslade (Cambridge: University Press, 1963), 433. Preserved Smith, The Life and Letters of Martin Luther (London: John Murray, 1911), 124-125, letter written by Luther, August 15, 1521, to George Spalatin at Altenburg. Gordon Rupp, Patterns of Reformation, (Philadelphia: Fortress Press, 1969), 121. Michael Clapham, “Printing,” A History of Technology, vol. 3, From the Renaissance to the Industrial Revolution, ed. Charles Singer, et. al (Oxford: Clarendon Press, 1957), 377.